Every once in a while special opportunities come our way. Earlier this year we were asked if we would be willing to prepare and serve a meal to a group of musicians from the Ukraine...and we said yes. A week before the event we met in the kitchen of the Chilliwack Alliance church to pre make some of the meal we would be serving to the members and some guests of the Kiev Symphony Orchestra and Chorus. This group arrived in Canada September 7th and September 9th was the date of their first Canadian Tour concert, and we had the joy of preparing and serving them dinner before the evening concert. We were so thankful that Kay joined us as this is a kitchen she is very familiar with and she was such a tremendous help. This group of talented musicians has performed at 17 concerts so far. You can find a list of all their upcoming concerts here. We encourage you to attend one of the concerts in your area and please pray for them and the ministry of Music Mission Kiev. At every concert across Canada there is a group of willing people who are preparing and serving a meal to these guests from the Ukraine. There is also a committee at each hosting venue who find a host home for these guests. Many have been so blessed through their music and many have been showing hospitality to these guests to Canada from the Ukraine. Back in the kitchen we were making Apple Slab Pies. There was lots of chatter and fun as we peeled and sliced up 25 pounds of apples. Bowls were filled with slightly salted cold water to keep the apples from discoloring. At another station in the kitchen pie dough was being made and rolled out. Sugar, cinnamon and flour were stirred into the sliced apples and then placed into the pastry lined baking sheets. Pads of butter were placed over the apples. Top crusts were added, edges were pinched, slashes were made, and an egg wash and sugar dusting made them ready to cover and freeze. The morning of the event my friend Debbie also came to help us, and she and Marg kept watch. We were so thankful for everyone who willingly came to help. Recipe is for 4 slab pies. Each pie cuts into 24 pieces. Prepare 3-4 over sized bowls with cold water and a few teaspoons of salt. This will be used to keep the apples from getting brown while peeling and cutting. Peel and slice apples. 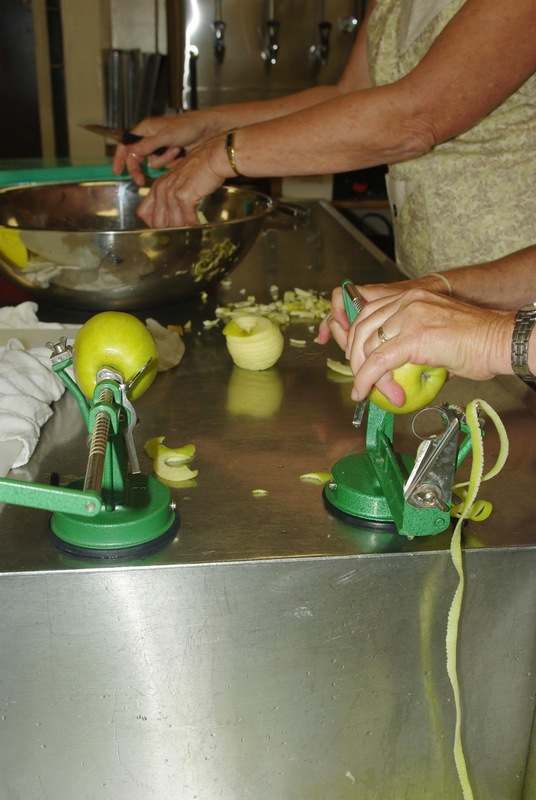 We used several apple peelers which peel, slice and core the apples quickly. Soak apples in slightly salted cold water. Set aside. Stir together the white sugar, flour, and cinnamon. Set aside. To make the pastry divide the flour, salt, brown sugar and baking powder evenly between 2 large mixing bowls. Stir well to mix. Place the vinegar and eggs in a large glass measuring cup and whisk. Add enough cold water to make 4 cups. Whisk again. Slowly pour 1/2 of this mixture into one bowl of flour/Tenderflake mixture and stir until the pastry comes together. With you hands pull together and form a ball. Add the remaining liquid to the other bowl of flour and Tenderflake. Again stir and then pull pastry together into a ball. Divide each ball into 4 equal pieces. This will give you 2 pieces for each of 4 pans. On a lightly floured board roll out pastry to fit a 13"x18" baking pan. Once the dough is rolled out, roll it around your rolling pin, place it at one end of the pan and unroll it onto the pan. Line all four pans with pastry. Drain apples well. Add the sugar, flour and cinnamon mixture to the apples and stir well to coat. Divide the apples between the 4 pans lined with pastry. Cut butter into little chunks and 'dot' over apples. Next roll out the remaining pastry to make the top crusts. Again the easiest way to place this large piece of pastry is to roll it up on your rolling pin and unroll it over the apples. Pinch the edges all the way around. Brush pies with an egg wash mixture of 4 eggs and 4 teaspoons milk or cream. Sprinkle lightly with raw sugar. Slash top crusts. To bake immediately, preheat oven to 375º F. Bake for 1 hour or until golden brown and you can see the juice from the apples bubbling clear and gelling around the edges. Poke a knife into one of the slash marks to make sure apples are tender. To freeze and bake later: (this is what we did) Cover pies with parchment and then wrap with foil. Place in a large freezer bag and place in freezer. When ready to bake preheat oven to 375º F. Unwrap pies and bake from frozen for 1 1/2 hours. Poke pies to see if apples are done. If the apples are not soft and if the pastry is still light continue to bake checking every 10 minutes. Let us know if you were able to attend a concert. Maybe some of you helped make and serve a meal or helped out in some other way at one of the concerts. We'd enjoy hearing about it. We were so blessed when we saw the concert in Abbotsford! Amazing musicians! Wonderful work to all of you, in welcoming our friends from the Ukraine! What kind of apples did you used in this recipe please. It looks so good and there's no drippings. Jane, you might want to check out all the other crowd-sized recipes on the blog. Go to the 'recipe index' tab and click on 'Cooking for a Crowd'. Those pies turned out great! So nice to see the start to finish. I love that you can make this ahead of time and freeze till needed! What an impressive meal you put together for the musicians! A team of volunteers from NLCC also had the privilege of cooking for them as well. We made Anneliese's chicken cordon bleu, roast potatoes, coleslaw, french bread, and berry crisp with ice cream for dessert. They really enjoyed the meal and their (singing) prayer was amazing! Amazing what you gals made for such a wonderful group. You've got it down to a science and those "slab" pies looked delicious! Bless you all. Omagosh! This brings tears to my eyes. My mom would make something like this for family reunions. So easy to whack out a chunk & eat it on the hoof. She's gone to glory some 21 years ago, so it's been at least that long since I've had this. Thank you for the recipe - and tender memory. Blessings -- Kristy from Iowa. Kristy, thanks for sharing about your dear mom. My mom is in glory too....about 12 years now. Isn't it fun when something so simple as a pie can bring back such tender memories. One day we will be reunited. What a glorious hope!